The last thread is so last year edition. Do not embed images larger than approx 250x250px (62,500px) into posts, please use thumbnails linking to a hosted image instead. It's a keyboard-driven stacking window manager (with limited mouse support) and is pleasingly minimal with no window decorations apart from a few pixels of border. Very stylish! May I add it to the jgmenu wiki screenshots? @Dobbie03 Happy New Year 2018 and Congrats on the new ArchLabs release-very nice. @Neil, Happy New Year to you too. Yay! Now I will be able to upload even more glorious pixel resplendent screenshots! 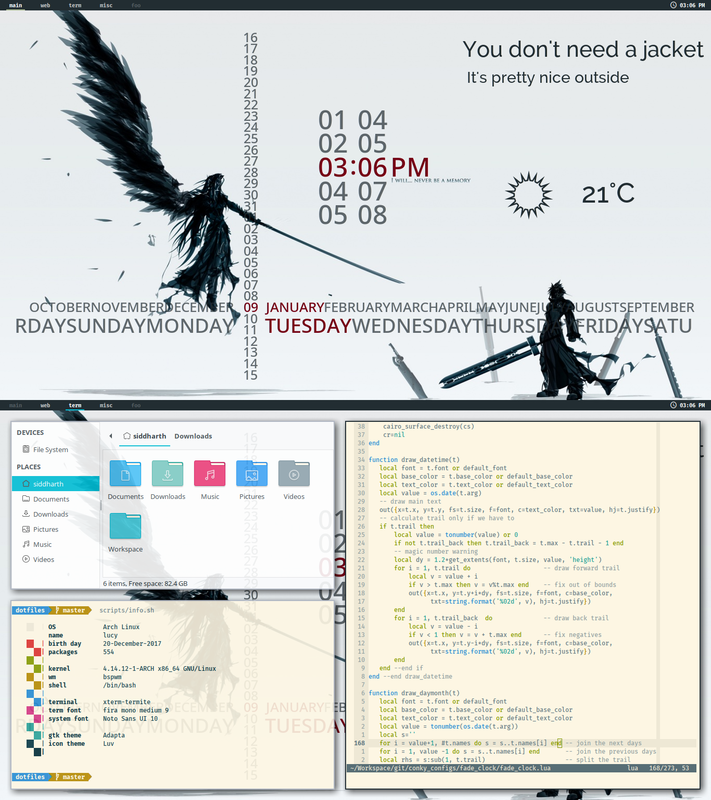 @serkir: Awesome tint2 (if it is tint2). Hope everyone's year is off to a good start. BTW, if anyone knows how to display icons only (no font) -or- employ a more readable font within the jwm 'tasklist' without changing the font in the rest of the 'tray'... I'd appreciate a pointer. Most excellent. Have updated my AL system! Back to arch after a brief tour of Debian Stable. Apps are xft-lemonbar, Thunar, termite, vim, conky. Working out of a VM... Ugh... not enough screen real estate. Nothing too crazy or advanced, coming back from a long hiatus. "Ask me how to exit vim." *It would be cool to have lightdm-gtk-greeter-settings installed by default.